The Kepler Space Telescope has revolutionized our understanding of exoplanets, or worlds orbiting other stars. It’s been the most successful planet-hunter by far, so far discovering thousands of exoplanets since 2009, with the promise of more to come. On May 23, 2018, NASA announced that Kepler has now begun the 18th observing campaign of its extended K2 mission. The campaign began on May 12, and will continue for 82 days; during that time, Kepler will focus on a variety of cosmic objects, including nearby star clusters, an infamous near-Earth asteroid called 99942 Apophis, and an exotic blazer in the distant universe called OJ 287. Indeed, to date, most exoplanets discovered by Kepler do orbit close to their stars, as they have been the easiest for the spacecraft’s observing system to detect. One of the objects Kepler is observing in this campaign is familiar to stargazers. It is Messier 44, aka Praesepe or the Beehive, located in the direction of the constellation Cancer the Crab. This is an open star cluster, like the one in which our sun is thought to have been born. Six exoplanets have already been discovered orbiting stars in the Beehive. Kepler will also be observing Messier 67, sometimes called the King Cobra cluster, another open star cluster in Cancer. Open clusters including Messier 67 and Messier 44 are regions where stars formed at roughly the same time. Thus, as we gaze toward these stars, we see them as approximately the same age. Kepler will be looking for exoplanets that are transiting, or crossing, in front of these stars as seen from Earth. 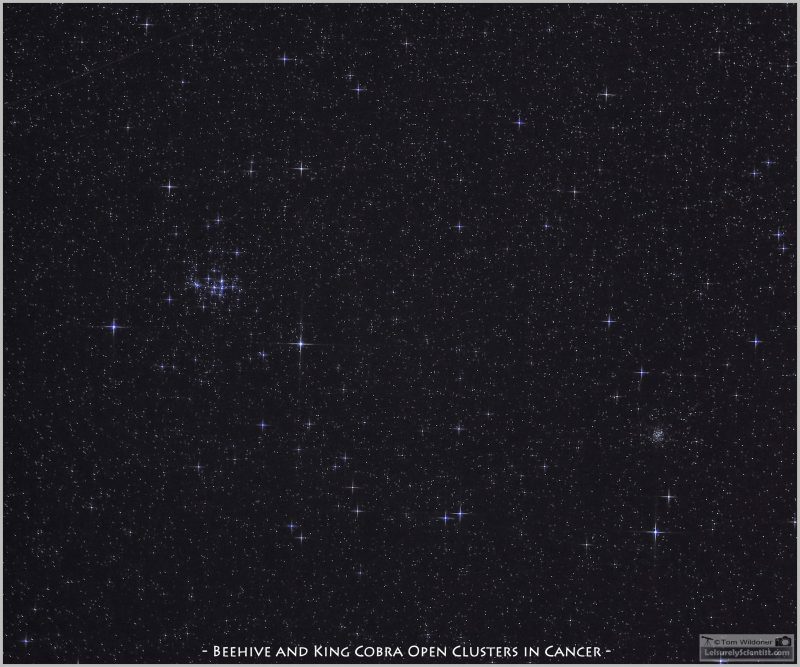 EarthSky community member Tom Wildoner caught this image of the Beehive star cluster (M44) and the King Cobra cluster (M67) in 2016. 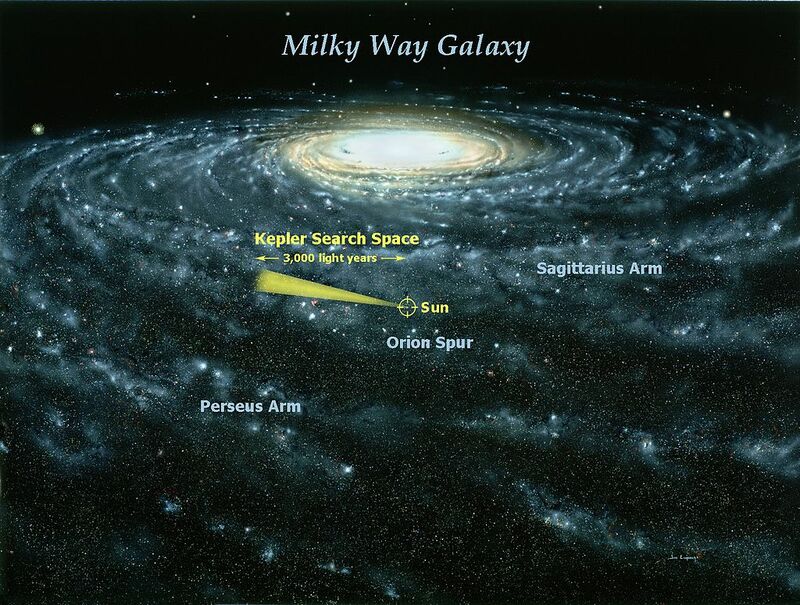 This is one area will Kepler will be looking toward in its 18th K2 mission. Read more about this image at Tom’s blog, LeisurelyScientist.com. Kepler will have an opportunity during its 18th K2 campaign to peer toward the infamous asteroid 99942 Apophis. This near-Earth asteroid – about 33 metres or 1,000 feet in diameter – caused a stir back in 2004, when early observations of its orbit suggested a small probability (up to 2.7 percent) that it would hit Earth on April 13, 2029. Although the probability that Apophis will strike us in 2029 is now calculated at zero, astronomers are still looking at future passes, and this near-Earth asteroid remains one of the most interesting objects out there. Apophis is one of thousands of near-Earth asteroids routinely tracked by astronomers on Earth. Sometimes, orbiting observatories like Kepler do take a look at Apophis as well. Thus, bit by bit, we increase our understanding of Apophis. 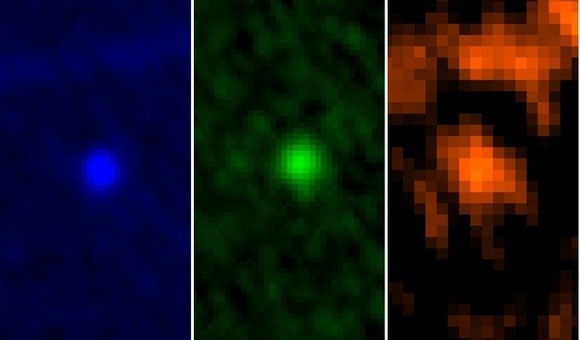 This image is from 2013, when the Herschel Space Observatory looked toward this object and acquired a 3-color view of the asteroid. Read more about this image. But – as it gazes toward its small section of space – Kepler won’t be looking only at nearby objects. It will also be looking at blazars, the energetic nuclei of very distant galaxies with massive black holes in their centers. One such target is OJ 287, where two black holes are in orbit around each other. One of these black hole is 18 billion times the mass of our sun! That’s in contrast to the 4-million-solar-mass black hole at the center of our home galaxy, the Milky Way. 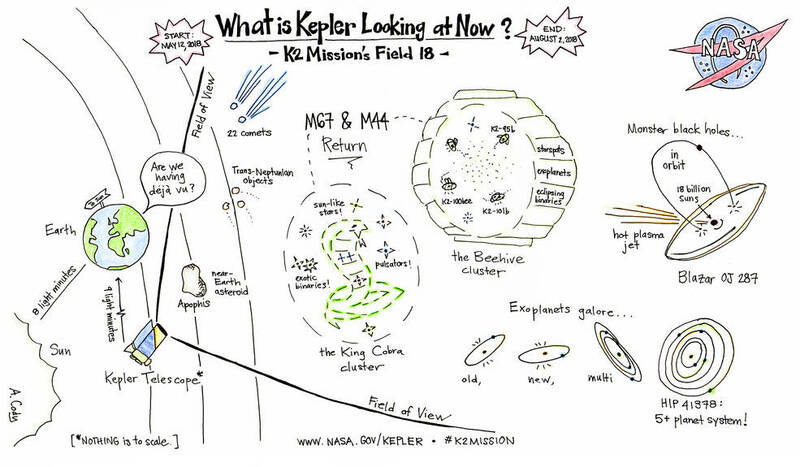 So this new observing campaign will be an exciting new chapter in Kepler’s K2 mission, and in the Kepler mission overall, which, unfortunately, will be coming to an end soon. The telescope is running out of fuel, with probably only several months left. By the way, it’s in many ways amazing we’ve had a K2 or extended mission. Kepler’s primary mission ended in 2013 after a second reaction wheel broke. That wheel was used to help the spacecraft remain steady with a fixed gaze on its targets, and, without it, Kepler could not do its work. 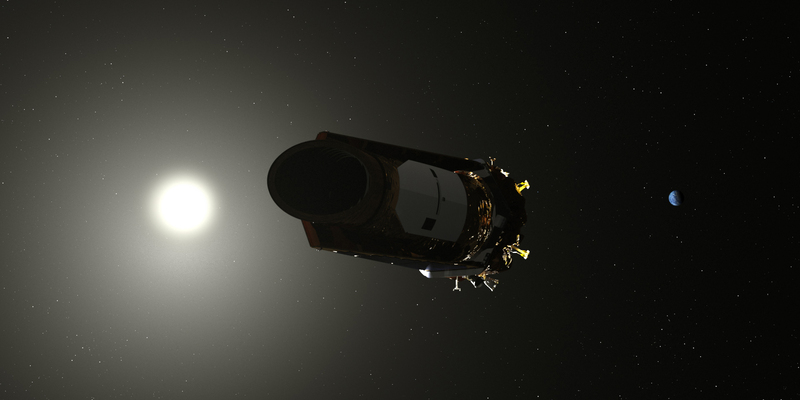 Later, NASA scientists were able to fix the problem – partially and, as always, cleverly – by using pressure from sunlight to help Kepler maintain position. This new phase is the extended K2 mission, and it was estimated that 10 observing campaigns would be possible with the remaining fuel. Kepler, by the way, already has a replacement. The TESS planet-hunter was launched in April 2018. Bottom line: Kepler has already discovered thousands of exoplanets during its mission, of many different types, and now, during its 18th observing campaign, it should be able to find even more, as well as provide unique views of many other cosmic objects and phenomena. Even as the mission is now nearing its end, the hobbled spacecraft continues to collect as much science data as it possibly can – a fitting finale for a spacecraft which has opened wide our views of these other worlds.